Italy Photo Gallery: Top 10 most popular articles in August 2013. 1.- The regions of Italy are the first-level administrative divisions of the state, constituting its first NUTS administrative level. The regions of Italy are the first-level administrative divisions of the state, constituting its first NUTS administrative level. There are twenty regions, of which five are constitutionally given a broader amount of autonomy granted by special statutes. 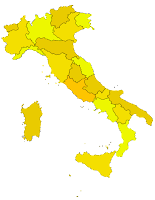 Mere administrative districts of the central state during the Kingdom of Italy, Regions were granted political autonomy by the 1948 Constitution of the Italian Republic. Nevertheless, the actual implementation of regional autonomy was postponed till the first Regional Elections of 1970, as the ruling Christian Democracy party didn't want the opposition Italian Communist Party to gain government in many of them where it was historically rooted (the red belt of Emilia-Romagna, Tuscany, Umbria and Marche). 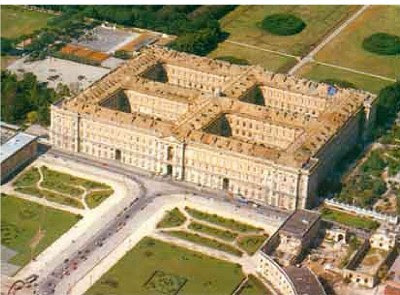 2.- Royal Palace of Caserta, the best example of Italian Baroque. 3.- The Castle De Cesaris of Spoltore has returned to live. The Castle De Cesaris of Spoltore (Abruzzo) is an ancient building, whose foundation is shrouded in mystery. It is now a private residence. It consists of a courtyard, a stable for twelve horses, the cellar, the barn and the dungeons.Some properties are due to the restructuring of the '500 and '700 presuppose an existing structure, probably related to the fortress on top of the hill on which the village stands. Seen from outside the country, the castle looked like a fortress from the perimeter wall and homogeneous with some impressive window and a single opening at the bottom. 4.- The Best Romantic Getaways in Italy. Costa Esmeralda (Sardinia): Since the 1960s, The Emerald Coast of Sardinia has been a mecca of the rich and famous, many arriving on million-dollar yachts for an off-the-record vacation. Heavenly bays are overlooked by olive tree covered hills. The coast with its sandy beaches is studded with some of the poshest beach resorts in Europe. Spoleto: Spoleto is as ancient as the Roman Empire and as timeless as the music presented there every summer during its world-renowned arts festival. The architecture of this quintessential Umbrian hill town is centered on a core of religious buildings from the 13th century. It's even more romantic during the off season, when the crowds are less dense. 5.- The Best Ruins in Italy. The Colosseum (Rome): Rome boasts only a handful of other ancient monuments that survive in such well-preserved condition. A massive amphitheater set incongruously amid a maze of modern traffic, the Colosseum was once the setting for gladiator combat, lion-feeding frenzies, and public entertainment whose cruelty was a noted characteristic of the empire (just ask Russell Crowe). All three of the ancient world's classical styles (Doric, Ionic, and Corinthian) are represented, superimposed in tiers one above the other. 6.- The Best Cathedrals in Italy. Italy has many majestic cathedrals, often with spectacular works of art inside. A cathedral is a city's main church and is usually called the duomo but also can be named basilica, cattedrale or chiesa madre (mainly in the south). There are a few rules to observe when visiting a cathedral such as no skimpy clothing, speaking quietly, and sometimes not taking photos inside. While most cathedrals do not charge admission there are a few that do. 7.- A beautiful mountain lake in the Dolomite Mountain Range. 8.- In Italy there are approximately 1500 the most important museums of the world heritage museum. 9.- The Fort Ceraino, originally called Fort Hlawaty, is a fortress built by the Austrians in the Veneto region. 6.- The Uffizi Gallery is the one of the oldest and most famous art 10useums of the Western world.